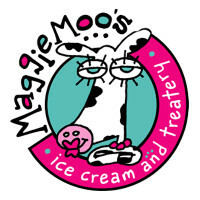 MaggieMoo’s Ice Cream and Eatery is a chain of restaurants selling desserts and ice cream across the United States. To find out how to apply for MaggieMoo’s online and to see what career paths are available, follow the link at the bottom of the page to get started on your MaggieMoo’s application today. The company was started in 1989 by Juel and Katherine Tillery in Kansas City. It gets its name from the name that their daughter gave a cow that she used to pass around town. In the United States there are locations in 18 states and internationally you can find stores in both Puerto Rico and Singapore. There are over 50 flavors of ice cream and frozen yogurt including sugar free variants along with a wide selection of mix-ins. You’ll find classic favorites such as Banana, Chocolate, Coffee, Strawberry and Vanilla, but also some new inventions like Black Walnut, Nutter Butter, Pina Colada, Pumpkin Cheesecake and Very Yellow Marshmallow. Their desserts range is almost as large and in addition to the ice cream and yogurt you can also order ice cream cakes like Chocolate Rocky Road Brownie, Cookie Jar Chaos and Peanut Butter Chocolate Brownie Overload. The cakes vary by location but you can always find the right cake for every occasion at one of their stores. The typical positions available with MaggieMoo’s careers are generally the entry-level position of Ice Cream Server. This is an excellent opportunity for applicants wanting to start off their career in the food service industry as it requires little experience. You can also find job opportunities for those with leadership experience in managerial positions. There are fewer corporate opportunities available with MaggieMoo’s jobs as most of the locations are franchised but there will be some occasionally. If you already have the relevant qualifications and experience you can submit applications for positions in the departments of Accounting and Finance, Administration, Sales and Marketing, Franchise Support and many others. How old do you have to be to work at MaggieMoo’s? You must be at least 16 years old or over to apply for jobs at MaggieMoo’s. The benefits to MaggieMoo’s jobs will be different depending on the location you are working at and the management team there. Typical benefits will be similar to other businesses in the industry such as employee discounts on food items available on the menu. Some employees may also be entitled to a health insurance package and retirement plans. The hours of operation are from 11am daily until 9pm Monday to Saturday and 6pm on Sundays. Ice Cream Server – The responsibilities in this job will help you gain experience in customer service and cashiering. You will be expected to greet and serve customers and answer any enquiries they might have. You will operate the cash registers and process different types of transactions. This job is usually paid at minimum wage at a rate of $7/hour. Assistant Manager – The job description of an Assistant Manager is there to help you on your way to the role of General Manager and you will be expected to run the store in their absence. You will supervise staff and assist with customer enquiries as well as some administrative tasks such as scheduling. The expected pay is between $11-12/hour. General Manager – The requirements in this job can be demanding as you must be able to supervise all operational aspects of the store. Your duties will include hiring and training new employees as well as management of the existing employees. There will also be back office administrative duties including scheduling and payroll. The salary is around $41k/year. District Manager – As a District Manager you will need to have leadership qualities and be able to organize multiple stores at once. It is important as a District Manager to be able to monitor the sales performance of each of the stores in your area and ensure that they are all performing well. The salary can be up to $240k/year. It will be easier to get through the interview if you practice some common questions once you’ve submitted your MaggieMoo’s application. Why do you want to work here? Always do some research on any company that you apply for because this question is likely to come up and it helps to be knowledgeable about the company and its culture. What is your favorite ice cream flavor? Make sure you’ve eaten there before and know what different flavors and desserts are on offer. Give a reason why you’ve chosen your favorite flavor, use it as an opportunity to show off your personality. How would you handle a customer complaint? It’s important that you are able to remain calm under pressure. It helps when you’re answering if you include examples of similar situations from your previous employment experience. What are your greatest strengths? When you answer questions like these you need to remember to keep your answers relevant to the job description. Every strength that you talk about should be relevant to the job. What is your availability? Have your availability worked out before you go so that you can give your preferences for what shifts you want. Sometimes they will have specific shifts to fill. You can find their website by searching for MaggieMoo’s jobs online or you can apply online through a recruiter. They list openings sometimes on each store’s Facebook page for restaurant roles. Most locations won’t be able to accept an online application form, but you may be able to submit a MaggieMoo’s job application online for corporate roles by contacting the headquarters. You can also make a direct application to a local restaurant in a few different ways. By searching online you’ll find that you can also download a printable application for MaggieMoo’s. You can either fill this in and hand it in personally or request a free application from one of their locations. Whether you submit your applications online or in person always make sure you double-check all of the information on both the form and your resume before you hand it in. It looks very unprofessional if you hand in an application with mistakes on it. When you hand it in make sure you are well presented. Most applicants will have at least one interview with a hiring manager, but the whole process will generally not take that long to complete and you can be working fairly quickly once you’ve been made an offer of employment. Make sure you maintain a positive and friendly attitude throughout the interview but remain professional. Freshberry Yogurt: See our guide for careers at Freshberry Yogurt. Boudin Bakery: See this page for jobs at Boudin Bakery. Baskin Robbins: See our guide for careers at Baskin Robbins. Rocky Mountain Chocolate Factory: For employment at Rocky Mountain Chocolate Factory visit the application page. Red Mango: See this page for jobs at Red Mango.